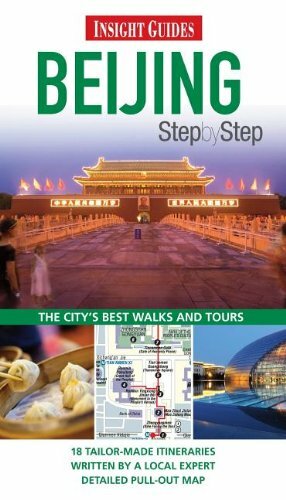 Step-by-Step Beijing is a new guide to this exciting city and its surroundings, revealed through a selection of clearly laid-out walks and tours, complemented by beautiful, full-color pictures, an authoritative narrative voice, and a wealth of practical information, all in a compact package. The guide starts with Recommended Tours, suggesting the book’s best tours for taking in the city’s unmatched collection of ancient sights, atmospheric old neigborhoods ranged around cobbled alleyways, atmospheric temples, early morning taiji practice at the Temple of Heaven, lively shopping and nightlife districts, and the spectacular Great Wall. In the Overview, an engaging introduction reveals essential background information on local culture, lifestyle and traditions, plus the lowdown on food and drink, shopping, and China’s fascinating history. This provides all the background information needed to set the walks and tours in context. The Walks and Tours section features 16 irresistible self-guided walking routes. The first twelve tours explore the city itself, and include Imperial Beijing, Wangfujing and the Foreign Legation Quarter, and the Olympic Park. The final four tours extend further afield into the surrounding countryside to the Ming Tombs and Great Wall, and the ancient village of Cuandixia. For each tour we show step by step how to get the most out of the destination, with something for every budget, taste and trip length. All tours have clear, easy-to-follow maps, hand-picked places to eat and drink en route, great insider tips and informative feature boxes. All this makes it simple for the reader to find the perfect tour for the time they have to spare. The final section of the book is the Directory, incorporating a user-friendly, fact-packed A to Z of practical information, plus carefully selected hotel and restaurant and nightlife listings, which will lead the reader to the best that Beijing has to offer.